This project made provision for interpretation at Lonbain township. Lonbain is an old crofting settlement located approx. 7 miles north of Applecross Bay. It was a linear settlement for which old estate maps can provide much information about changes in rural settlement patterns over time. Before the road was completed in the 1960s Lonbain was an isolated area. 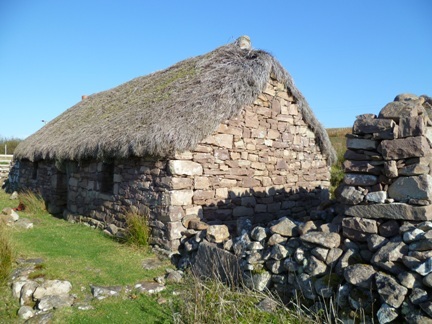 Lonbain Thatched Cottage is the sole remaining thatched cottage in the township and has recently been purchased by National Trust for Scotland, who have commissioned a Conservation Plan for the cottage as part of their plans to conserve and consolidate the site. As the Lonbain Thatched Cottage is now in the hands of the National Trust, there was no longer a requirement for ALPS to be involved. The funds for this project were redirected to the Trails & Thoroughfares programme.